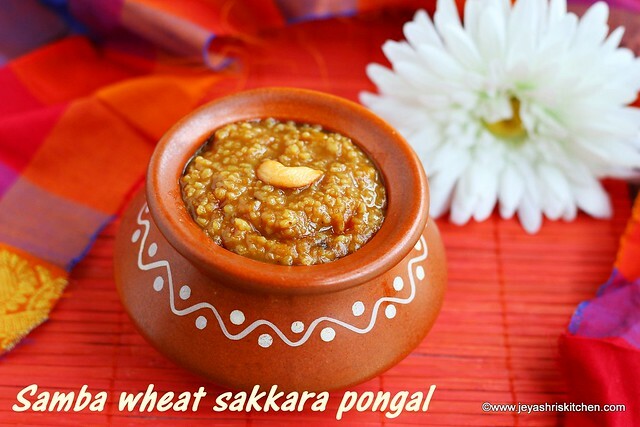 Samba wheat rava Sakkarai pongal, Pongal festival is around the corner, and i have Collection of Pongal festival recipes in Jeyashri's Kitchen. Few days back when i was cleaning my bookshelf, i came across a old Aval Kitchen book, Jan 2015,where my picture of Sakkarai Pongal was published as a cover page. When i saw inside the book, there was a collection of Pongal recipes by Madam Menu rani Chellam and this samba wheat sakkarai pongal was also there. I wanted to try this for the pongal festival 2018. You can make this for navaratri, aadi velli neivedyam, thai velli neivedyam and any other festivals too. In a pan add 1 tsp ghee and add the cashew nuts first, when it is half roasted add the raisins to this. You can fry both separately too. Cashew takes little time to get roasted but raisins gets cooked fast, so do not put both together. In the same pan add the samba wheat and the moong dal. Roast in a medium low flame for 5-7 minutes. Transfer this to a bowl and add 2.5 cups to 3 cups of water. Pressure cook this for 7-8 whistles and keep in a low flame for 2 minutes. Once the pressure is released, take this out and mash well. In a pan add the jaggery and add little water. Let this dissolve in water. Let this jaggery water boil for 2 minutes. Add the cooked samba wheat mixture to the jaggery syrup. Add 2 tblsp ghee to this. Mix well and add the cardamom powder, nutmeg powder and edible camphor. Add the roasted cashew nuts and raisins. If you want smear little melted ghee on the pongal just before serving. There is not difference in taste between rice pongal and samba wheat pongal. Colour of the pongal depends on the color of the jaggery. I added 1 cup of jaggery to the samba wheat sweet pongal and it was perfect.